(CNN) -- The remains found last week on the bank of an Illinois river and near a blue barrel are not those of Stacy Peterson, Illinois state police said Wednesday. 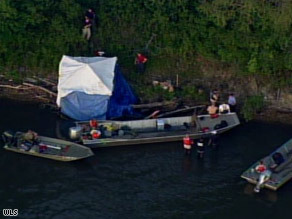 Partial skeletal remains were found on the south bank of the Des Plaines River near Channahon, Illinois. Many people speculated that the remains, found near the Des Plaines River less than 30 miles from the homes of Peterson and another missing woman, Lisa Stebic, meant one of their disappearances would be solved. But testing done on the remains showed they belonged to a male, police said. Officials had to conduct further testing on the "partial skeletal remains," consisting of a rib cage, spinal column and partial left and right femur, after a preliminary autopsy did not reveal any identifying information. A marine cleanup crew discovered the remains in Channahon, Illinois, last week along with shreds of blue jeans and a small amount of money. Stacy Peterson, 23 when she was last seen in October 2007, was former police officer Drew Peterson's fourth wife. They lived in Bolingbrook, Illinois, 20 miles from where the remains were discovered. So when news came that a few days before the remains were discovered a woman named Michelle Williams found a blue barrel in the same area, many people expected Stacy Peterson had been found. Though her case still remains a mystery, her family remains hopeful there will be a solution. Drew Peterson was indicted May 7 on charges he killed his third wife, Kathleen Savio. Savio died while the two were in the midst of a nasty divorce. The death was originally deemed an accident, but authorities took a second look at the case after Stacy Peterson's disappearance. Drew Peterson has pleaded not guilty. Others had suspected the remains could be those of Lisa Stebic. Channahon is 15 miles from Plainfield, Illinois, where Stebic was last seen in April 2007. On the day she disappeared, she petitioned a court to have her husband, Craig, evicted from their Plainfield home. Craig Stebic told police he was working in the backyard when his 37-year-old wife left home about 6 p.m., taking her cell phone and purse. Authorities have said they believe that Lisa Stebic was the victim of foul play and have named Craig Stebic a suspect.